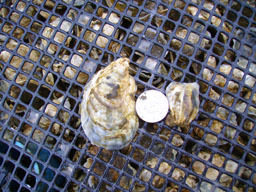 Oysters remove a great deal of nitrogen from the saltwater environment as part of their natural growth and functioning. That is one reason it is important to sustain the health of our local populations, and OPC is working to do just that. On the town level, the Shellfish Department grows between 600,000 and 1,000,000 quahaug seed and 250,000 to 400,000 oyster seed annually. Grow-out methods include bottom planting with use of protective netting, stackable trays and plastic mesh bags. 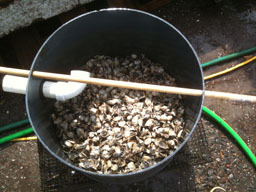 The Town does not currently operate an up-weller system and obtains its shellfish seed from a local hatchery. Natural oyster production ceased at least three quarters of a century ago so getting them back in Orleans waters would be cause for joy. On the private level, there are now 21 shellfish grants in Orleans farming oysters and quahaugs in our waters plus a small mussel grant. In the past several years, Cape Cod Bay flats have been added as a grow-out site for 2 companies joining aquaculture businesses in Provincetown, Wellfleet, Eastham, Brewster, Dennis and Barnstable in Cape Cod Bay and off-Cape sites in Duxbury Bay with new grants soon to be issued in Plymouth. The industry Cape-wide in Cape Cod Bay has really taken off in the last decade or so producing millions of fantastic oysters. Eastham has 14 grants in Cape Cod Bay and 4 in Nauset Harbor and Orleans has 16 grants in Pleasant Bay. All of this private aquaculture activity in Orleans has taken place only in the last 25 years with most of the growers switching from quahaugs to oysters. 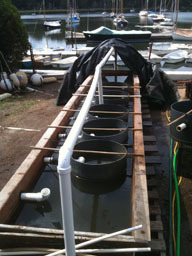 On the non-profit side, OPC recently got into shellfish with a project begun this summer through the generosity of the folks at Arey’s Pond Boat Yard who are allowing OPC to have a land-based upweller nursery system on their property. The 15,000 oysters were donated from ARC, the local hatchery that supplies most of the seed for the entire Cape shellfish industry, public and private. 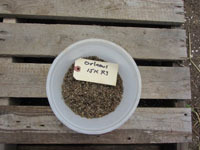 The OPC project is operating under the auspices of the town through their seed propagation permit and once the seed is large enough, Dawson Farber, Shellfish Constable and Harbormaster, will determine where they should go for final grow-out. Over two months, as the oysters grew, six silos would be needed. That said, at this point, we don’t have enough shellfish in the water to sustain healthy populations although we also don’t know exactly what a healthy population needs to be for sustainability. What we have now in no way compares to historic levels of shellfish when there were fewer people. Some years, there appears to be plenty of shellfish around and some years there are very few – there can be lots of reasons for population fluctuations and a particular cause/effect may not be known. Scallops are in short supply and the once-dominant mussel population crashed which means it’s all about clams and quahaugs. What we have seen, though, is a reduction in effort which may be tied to stock abundance but more importantly is a probable result of a social/cultural shift away from shellfishing as a recreational activity that used to be enjoyed by many people. Those who are still digging their own shellfish seem to be finding them. As we try to sustain the health of shellfish, shellfish sustains the health of the estuaries and by extension, us, through their filter-feeding capacity. They are extremely important converters of nutrients in the estuaries through complex bio-chemical processes. But focusing on shellfish requires a leap of faith because of a host of unanswered questions. A biological reality, though, is that you have to have babies to have adults and you have to have adults to have babies and if you don’t have one, you can’t have the other. It’s a numbers game so when too many adults are taken and there aren’t enough to produce the seed, the population dwindles and if the seed dies (or is harvested) before it matures, the population dwindles. To get to the point of healthy stocks, it takes a lot of work and funding and time because they don’t grow overnight. None of the projects listed above, public or private, is successful automatically. During the time they are growing, anything can and does happen to them because we are talking about natural environments so it takes patience, luck, skill, attention to details, faith of the funders to see it through and the kindness of Mother Nature to help out without throwing too many curve balls in the process. For oysters, you need to watch them for nearly three years but for quahaugs, it can be an agonizingly long five to five to seven years and most people don’t have that kind of patience. There are places where they grow faster than that but it is still in the order of several years. The whole upweller was scrubbed weekly. Orleans has three separate estuaries, 56 miles of shoreline and thousands of acres that could be productive. Replenishing the supply is a daunting task requiring millions and millions of seed each year over a long period of time and a huge commitment from the entire community to recognize the benefits of healthy shellfish populations and to pull it off. In fiscally tight times, shellfish often are not recipients of citizen largesse. Upweller with five working silos. 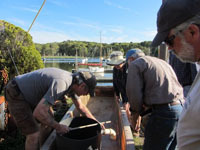 But the pilot demonstration project begun this summer proves that there is interest in shellfish, that people are willing to put in some time volunteering to get wet and dirty just to see oysters grow fabulously fast. If we could harness that energy, who knows how far it could take us but there are examples around the country of citizen groups doing similar projects with fantastic results. There are people in those organizations who would be willing to share their experiences if we ask them. 2016: 30,000 oysters planned for June.